Achieve improved skin with the 'Skin Tight' Body Serum from Mio. Ideal for use on arms, thighs, knees or an overstretched stomach, the fast-absorbing serum is enriched with hyaluronic acid and rejuvenating pomegranate seed oil to help improve the appearance of bumpy, uneven skin and deliver intense nourishment. Packed with powerful antioxidants including vitamin C and green tea extract and enriched with exfoliating papaya enzymes to help refresh skin, this serum can help you to reveal a brighter and refined appearance. Free from parabens, petrolatum, colorants, xenoestrogens, PEGs and phthalates. Apply once or twice daily and massage into skin using large clockwise motions. I have just received the serum and I have already applied it on my elbows, upper legs and stomach. It is easy to apply, it is quickly absorbed by skin and the skin feels very soft. I will come back with an additional review after I finish the serum. I really hope it will work! The package arrived extremely fast in Romania. loving the skin tight body serum, goes on so easy and absorbs quickly. 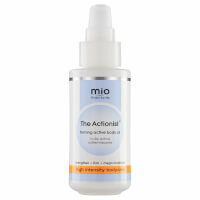 Im looking to add other Mio products to this body serum. Can't wait to see the results! I initially got this when Mama Mio had Get Waisted and Skin Tight a few years back as a gift set.When I started using it the first round, I had taken pictures every day or 2-3 days to see if the money was worth it and if the results were real. I can tell you that I will always come back to this because it is worth it! My photos shown before, during and after I was done using this were incredible! It went from post-baby bloat to taut and toned flatter with a little baby pooch, which I'm OK with. I would say that exercising would provide an even greater benefit and I use it on my thighs and upper arms too! I used it the second time around after my second pregnancy and it's still amazing! I got this after my first pregnancy and it definitely got my postpartum stomach back to its previous state. After having my second baby, I shopped around a bit, but couldn't be convinced to use anything else! It is pricey, but it is worth the price when it works as well as it does! I can tell a difference on my 60 year old legs! This is an amazing product! I have sjogrens syndrome, which causes very dry skin. I have tried many different products some of which were prescribed by my physician and were very expensive, but did not work. I found this product in a magazine called the feel good store. The skin on my face is extremely dry and I also have bags under my eyes. After the first application the results were amazing, almost too good to be true. I also use this product on the under side of my upper arms and I'm noticing improvement in that area too. I highly recommend this product! I was introduced to Skin Tight by a skin care professional. I have been using it every night for the last few months, The first treatment made a noticeable difference in refreshing my tired skin. I have noticed continual improvement in tightening the skin under my chin and has virtually eliminated the fine lines around my eyes. I use it at night before bed and love the way my skin feels. I will continue to use it as part of my daily routine. I bought this and after a few weeks I noticed a difference. I love this product. I lost 7lbs so I have saggy over stretched skin on my tummy and this has been helping tighten up my skin. It's not a big bottle but lasts a long time. You don't need to put too much. This product has exceeded my expectations. I had saggy skin above my knee caps, on the crook of my arms and my elbows. I began using Skin Tight twice a day and have been using for months now - the skin above my knees has tightened and it no longer disgusts me to look in the mirror at my legs! The skin on the inside of my arms is taking a little longer but there has been a noticable improvement. I will continue to use this product for fear the saggyness will come back!